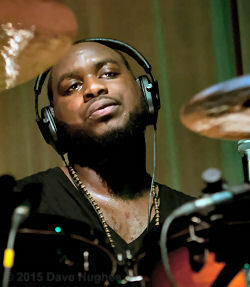 We mainly know Ginger from hitting the drums behind one of the UK’s most powerful voices, Jessie J, but a look at his biography shows that he was a well established drummer long before that. 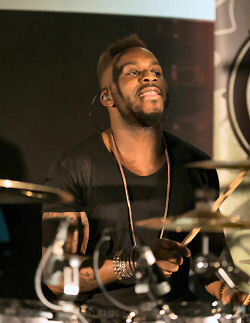 Today, at the age of just 24 he has played stadiums, arenas and TV shows all around the globe and held a masterclass at the London Drum Show 2014 alongside Dexter Hercules. 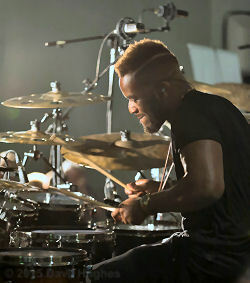 I caught up with Ginger after his performance at LDS to chat about his love for drums, his way into the session scene and the relationship with his brother. My mum said that I was always tapping stuff from a young age. I grew up in church and was there every Sunday. Every time a song was played I would be tapping along. Apparently I was quite good with my timing back then as well. When I was three, my grandma bought me a toy drum kit – a little blue one – and I basically battered it to pieces. Then later, my parents bought me a miniature kit, a little red one, but I battered that as well. Later I played in church every Sunday and then grew up playing for different Gospel artists. So all your early influences were church related? The very early stages yes! I listened to a lot of Gospel, music like Hezekiah Walker, Kirk Franklin, Helen Baylor, The Winans, Commissioned – a lot of their drummers. 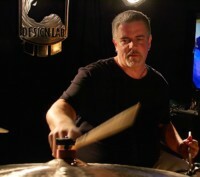 Then, as I got older, I started listening to ‘drummers drummers’ like Vinnie, Steve Gadd, Dennis Chambers, Aaron Spears and stuff like that. Did you take lesson in those early days? I had a few back then but I had more during secondary school. Would you say that church and religion influences your music a lot? Yes, 100 per cent. Growing up in church obviously gives you a spiritual element to it and playing there has a lot of feeling, emotion and spirituality to it. Now, even though I’m playing pop music, I still try to play with that same emotion and feeling. I like to leave my heart out on stage when I play. How much does the Gospel side of things influence your playing in your daily work life? As much as I can! My groove and my feel stem from that area, so even when I’m grooving it’s still that. But in church we learn to play lots of different styles – anything from salsa, funk, jazz, rock, it’s all part of it. Do you still play in church if you find the time? Yes, whenever I can. Normally I play more keyboards there actually. Your first professional appearance was with Kelly Rowland. Soon after you moved onto the V.V.Brown gig. How did that come about? Yes, I did some TV stuff with Kelly Rowland which I got through an MD who I grew up playing with in church. 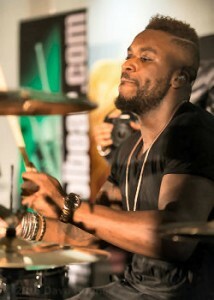 Then V.V.Brown’s drummer went to do Grace Jones so I got called to dep and then stayed on it. 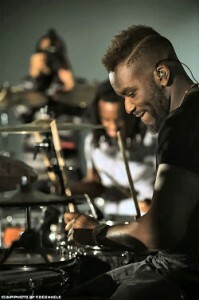 We now know you mostly for hitting the drums for Jessie J. How did that gig change your career? Was it challenging at the beginning? Yeah, I mean Jessie is the gig that got me the most exposure outside of the UK. It was basically just her being her, the whole project snowballed really quickly. I was fortunate enough to be on it from the beginning and still be on it now. It wasn’t really challenging, it was kind of what I was used to. I had just finished an arena tour with Peter Andre, which was my first taste of playing for a big artist. Between V.V. and Jessie you’ve worked with loads of artists. Any favourites? Oh, I don’t know if I can answer that. I’ve loved each tour I’ve done for different reasons. Whether it be the talent of the artist, or their personality on stage – every tour I’ve taken a positive thing from it. You played a solo performance at the London Drum Show 2011. How did you career, playing or approach change since then? Yeah, I think my approach changed slightly. Hanging out with Dexter Hercules a lot, I’m starting to looking at a more technical approach to my playing while still keeping what I’ve got now. Just adding to my arsenal so to speak. Was that not something you were into before? Not that much, I would just do a lot more linear stuff, which is still cool, I just wanted to broaden my horizon and get into a more rudimental way of playing. You’ve done a few clinics over the last years. Is that something you could see yourself doing more? Yes, 100 per cent. Hopefully I can get some in 2015 if the calendar permits. Do you have a bit of an agenda for your masterclasses or are they more performance based? At a lot of the clinics that I have done I get asked about being a session musician, how I got into it and what people need to do to kind of thrive in the session music industry. That’s how I would base it but put my spin on it, and probably add electronics drums to it because that’s been coming in over the last few years with music getting a lot more electronic. 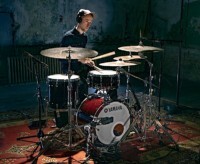 It’s good for drummers to know how to use electronics and how to use them with acoustic drums, not only as an accessory but as a drum as well. On the Jessie gig I use a lot of pads and triggering too. I have a Yamaha DTXM12 pad, an electronic kick and a pad on my right and I use acoustic triggers on my kick drum and my second snare. I started doing the triggering stuff on the Peter Andre gig, so it all stems from that. When I started playing with Jessie the gig demanded it pretty quickly too. Do you still have time to practise nowadays? What do you work on? Yes, I practise a lot with Dexter. He’s got a studio in south London and whenever we’re both available we’re in there chopping it up. We like to practise to songs and find percussive elements in the vocals, bass line or keys parts for us to accent just to make it more interesting and make our way of practise more musical. Looking back, is there anything you now wish you would have spent more time on practising over the years? Maybe as some advice for young drummers. My technique! I mean, I’m kind of playing catch up now. Definitely rudiments! I had already been playing for seven years before I really got introduced to that stuff in my early teens, so there was a lot of habit in my playing already. Also I don’t read music, that’s another thing! Was there any other genre besides Gospel that was a bit of an ‘a-ha’ moment for you? Yeah, when I started checking out fusion. I’ve always been a sucker for Robert Glasper and that kind of style jazz as well. Jazz piano with hip hop beats, that stuff excites me! The relationship with your brother (Michael ‘SmoothGroove’ Hamilton, bass player and MD) is not just family based, you have played together for a lot of artists too. Drums and bass being strongly connected in music, how did your personal connection affect that? Yeah, we’ve done loads of artists together – V.V. Brown, Peter Andre, Stooshe and he now does the Jessie gig as well. We’ve always been playing together. He started playing the bass when I started playing drums, so we kind of came up together. I think the relationship with the bass player is integral, because once drums and bass are locked, it just cleans up and gives everything else space. If drums and bass are fighting each other then it’s just messy and not a great experience for everyone else in the band. I try to emulate that feel I have with my brother with every bassist I play with. Yeah, I think it’s very important to have a great relationship with your bass player, whether that’d be if you’re in a band or if you’re a session guy. Dream gig – dead or alive? Dead would have to be Michael Jackson. I would have loved to play with him! Now, it would probably be Stevie Wonder or Prince or maybe Eric Clapton, I’d love to do something like that. Any advice for up and coming drummers? Yeah, advice for any drummers really, something I’ve been saying to people when doing my signings after a show: stay hungry!! I know I speak for people who do it for a living, but sometimes you can fall out of love with drums. That’s why I think events like the London Drum Show are so important because it makes you fall back in love with the instrument itself and you’re getting that feeling back which was the reason why you started playing. It’s important for your playing to just always love the instrument. Thanks a lot for your time Ginger, all the best for your 2015!